Aston Palicte, fresh from demolishing Puerto Rico’s previously unbeaten Jose Martinez, is hungry for a world boxing title and if it means bowling over countryman WBO superflyweight champion Donnie Nietes in a rematch, his manager Jason Soong said yesterday he’s ready to do whatever it takes. Palicte, 28, was in devastating form when he blasted Martinez into submission at 2:18 of the second round in their WBO title eliminator at the Viejas Resort and Casino in Alpine, San Diego, last Thursday. Palicte softened up Martinez for the kill with shots to the side of the body then rained blows to the head until referee Raul Caiz, Jr. halted the carnage. Martinez took a pair of mandatory 8s as Palicte stepped up his attack in the second. There should’ve been a third knockdown but Caiz ignored Martinez touching the canvas with his right glove after tasting a brutal uppercut from Palicte early in the second. Martinez was helpless along the ropes when Caiz waved it off. Palicte said he prepared for the eliminator like a world title fight and thanked Jones, whom he called his idol, for the opportunity. He said it’s always been his dream since he was a kid to become a world champion. Last September, Nietes and Palicte battled to a split 12-round draw at the Forum in Inglewood, California, leaving the WBO 115-pound throne vacant. Instead of ordering an immediate rematch, WBO president Paco Valcarcel sanctioned a fight between Nietes and Japan’s Kazuto Ioka for the vacant title and matched up Palicte with Martinez in an eliminator to decide the mandatory challenger. As it turned out, Nietes scored a split 12-round decision over Ioka to win the crown. Martinez came out smoking in the first round and both fighters traded vicious body shots as ringsiders wondered who would fold up first. Once Palicte got Martinez’ attention to defend the body and lower his guard, the 5-8 Filipino began to bang the head. As Martinez ducked, Palicte found the top of his head an easy target for his axe-like clubbing bombs. Martinez kept holding the back of his head, in obvious pain and complained about being hit with illegal shots but Caiz ruled there was no rabbit punching. Palicte’s execution was precise. Martinez was clearly bothered by Palicte’s four-inch reach advantage. Paclite unleashed 1-2-3 combinations that started with a left jab followed by a right straight to the head and a left half-hook, half-uppercut to the side of the body. Martinez tried to slow down Palicte with body shots of his own but his come-forward style proved to be his undoing. Martinez wouldn’t back down and paid the price for his aggressiveness. Working Palicte’s corner in the fight were former WBC lightflyweight champion Rodel Mayol and cutman Ting Ariosa. Mayol said he couldn’t ask more from Palicte. “Masaya ako sa performance ni Aston,” he said. “Nasunod niya ang plan namin na hindi takbuhan. 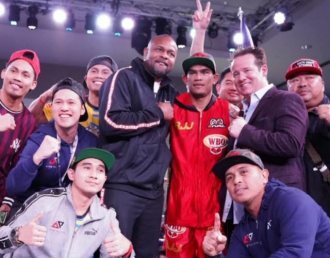 One step backward lang para mag-mintis yung straight ni Martinez at yung mga combinations na prinaktis namin, pasok na pasok at sakto ang conditioning kaya panatag ako na ma-knock out yung kalaban.” Palicte had been in the US training at the Wild Card Gym since Dec. 23. The win raised Palicte’s record to 25-2-1, with 21 KOs. He’s unbeaten in his last six outings, 15 of his last 16. His last loss was a split decision to Mexico’s Junior Granados in Merida in 2016. Martinez suffered his first setback as his record dipped to 20-1-2, with 13 KOs.